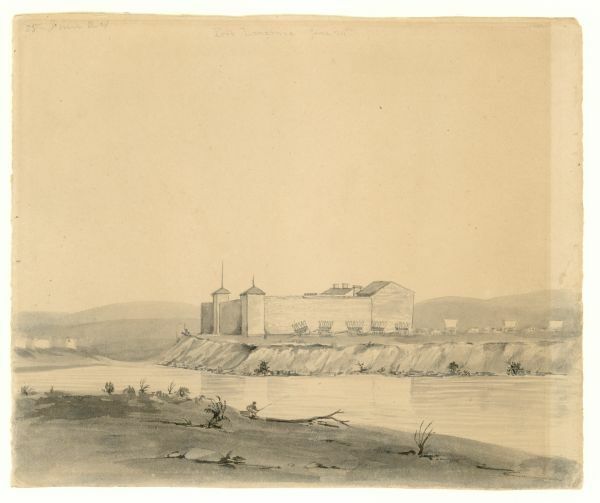 Original wash drawing of Fort Laramie, Wyoming (actually Fort John; see note below). Sketched by Wilkins on his 151-day journey from Missouri to California on the Overland Trail (also known as the Oregon Trail). Wilkins stayed here for a few days to stock up on supplies and rest before another long leg of their journey. Wilkins writes in his diary: "Arrived this morn by 8 o'clock at Fort Laramie where we shall stay a day or two to fix up, get our tires cut and other repairings. This is a great resting place for emigrants. Most of them by this time have seen enough of the elephant to know what they really want, and what they can dispense with. Wagons, especially heavy wagons, can be bought here for an old song. A great many parties abandoning their wagons at this point and take to mule packing on account of the rumours of no grass and bad rocky roads, their object being to get thro' at some price and as quickly as possible." From the Fort Laramie Official National Park Handbook (#118), p 40-41: "Fort Laramie's soft cottonwood logs were rotting. Instead of trying to patch the decay, the American Fur Company decided to outdo Fort Platte by erecting, at a cost of $10,000...a whitewashed adobe fort of its own. The site chosen was the top of a low bluff bordered south and east by the coiling Laramie. It was a little more than a mile upstream (south) from Fort Platte and a short distance from the original Fort Laramie. The company named the new structure Fort John after John Sarpy, an influential stockholder. Everyone else continued calling it Fort Laramie. Fort John (Laramie) was somewhat larger than Fort Platte. Its walls, surmounted by pickets to make scaling difficult, stretched to approximately 121 feet by 167 feet. Each of the 18 rooms inside the stockade was equipped with one door and one window opening, as usual, onto the courtyard. Across the courtyard from the main gate was a two-story structure whose upstairs room housed the post's chief trader and his family. The usual horse corral occupied the eastern part of the plaza."